These chrome plated rocker arm shaft end plugs will add that classic Knucklehead look to any Ironhead Sportster or Shovelhead engine. Installation or removal is much easier than original slotted Harley part. Replaces OEM's 17448-57 and 17448-71. 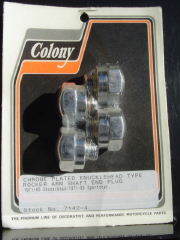 Colony Stock #'s 7142-4 & 7143-4.